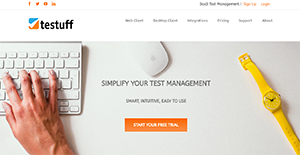 Testuff is a flexible and comprehensive software test management application. It enables users to work in the testing methodology established in their workplace, making the solution easily adaptable to their workflow. With Testuff, developers can also look forward to working without limits. That is because the testing tool supports an unlimited number of testers, tests, and projects and is also able to generate an unlimited amount of reports. Moreover, developers can also view the changes made in applications and software since Testuff makes certain that every modification done is recorded. This makes troubleshooting less arduous since the issue can be expeditiously found through comprehensive audit trails. With Testuff, developers are able to work both on their desktop computers, laptop, and mobile devices. This allows them to be productive even while they are out of the office and lets them respond to issues and queries instantly while on-the-go. No matter which language they speak, Testuff works to provide users with an interface that they can navigate with ease. On top of that, the platform is a user-friendly one with a gentle learning curve. This means that users need not read up on how-to guides to utilize the software—they can do their tests and concentrate on them immediately after set-up. Testuff is a comprehensive solution equipped with the necessary tools needed by developers to better manage their projects, from incubation to maturation. The application also comes with a defect management module, which enables users to detect issues and troubleshoot them as soon as they are found. Further, Testuff has tools that let users manage requirements, generate reports, and more, allowing them to be more productive with the use of one application. Testuff supports bi-directional connections with any bug tracker. The application even enables simultaneous integration with several third-party bug trackers at once. This lets users utilize other tools in managing and executing their tests, allowing them to get more tasks done. On top of that, Testuff integrates with automation tools that enable developers to automatically submit their test results into the system. This saves them time in transferring data between systems and also makes certain that information remains the same before and after the transmission. Not all developers use the same kinds of testing methodologies. This is something Testuff understands, which is why the application supports several methods. This means that it is the software that adjusts to the users and not the other way around. What Problems Will Testuff Solve? Some companies or developer teams handle hundreds and even thousands of projects concurrently or over time. For seamless overseeing of numerous applications, Q&A managers can rely on Testuff. That is because the software supports unlimited number of tests and projects and also lets teams add more testers into the system. For companies that work with innumerable projects, they require a system that lets them organize their files and documents in a way that they can be easily accessed at any time. Testuff rises to that challenge by enabling hierarchical organization of files and folders, letting users pull up the files they need with ease. Developers sometimes need help in pinpointing bugs in the software. With Testuff, they can do so painlessly and even interactively since the tool keeps video records of testers’ movements. This lets them understand and identify issues and resolve them immediately. If you are interested in Testuff it might also be sensible to check out other subcategories of Best Test Management Software gathered in our database of B2B software reviews. Each organization has different needs and requires a software that can be customized for their size, type of workers and customers, and the particular industry they are in. For these reasons, no software can proffer perfect tools out-of-the-box. When you try to find a software system, first be sure what you need it for. Read some Testuff reviews and ask yourself do you need basic functionality or do you want sophisticated functionality? Are there any industry-specific functionalities that you are looking for? Get the answers to these questions to help your search. There are plenty of aspects that you need to mull over and these include your budget, particular business requirements, your company size, integration requirements etc. Take your time, use a few free trials, and finally select the system that offers all that you want to enhance your organization efficiency and productivity. How Much Does Testuff Cost? We realize that when you make a decision to buy Test Management Software it’s important not only to see how experts evaluate it in their reviews, but also to find out if the real people and companies that buy it are actually satisfied with the product. That’s why we’ve created our behavior-based Customer Satisfaction Algorithm™ that gathers customer reviews, comments and Testuff reviews across a wide range of social media sites. The data is then presented in an easy to digest form showing how many people had positive and negative experience with Testuff. With that information at hand you should be equipped to make an informed buying decision that you won’t regret. What are Testuff pricing details? What integrations are available for Testuff? If you need more information about Testuff or you simply have a question let us know what you need and we’ll forward your request directly to the vendor.